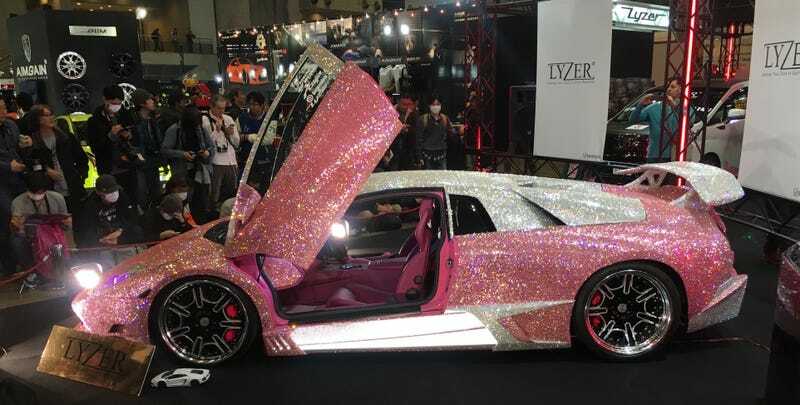 Entire supercars covered in Swarovski crystals, cars with special modified doors the exhibitors clearly had trouble operating, wheels that won’t turn, speakers and screens that pretty much obliterated storage space, leg room, or in some cases every single seat in the vehicle, TAS 2016 was host to dozens of cars which required a ton of work but no one could actually drive. Speakers next to the engine block? Does anyone else think this is a bad idea, or is that just me? This car has no seats. Just speakers. Speakers where there used to be seats. Yet it still has seat belts. Someone tell me why. Why does it have seat belts for the non-seat speakers? ....NOPE. Crushing my hopes and killing my dreams. Backseats are for losers, and I should know, considering I took my own out. Of course, I did it for storage, and not to ADD ALL THE SUBS! This one is actually fairly tame, except I was sure that the screens and speakers in the hard top would hit someone on the head when it closed. Yeah, that used to be a four-door Honda/Acura. However, even if you know that, these photos just do not do justice to how long it is. It really seems to go on and on forever. Trunk space? Who needs trunk space!